This is the best how to measure motivation model I have ever come across. The Ambassador model is a model where you combined commitment and understanding or “the intellectual” and “the emotional capital” as it is also called. The principle behind how to measure motivation is that you, by using a simple survey, will get statistic facts that divide a group of people into four behaviour styles. This four groups gives you a picture of how motivation looks in your organisation. If you want to know how to measure motivation, it is the Ambassadors you are looking for. Ambassadors are the people that know what they need to do in order for the whole group to reach their goals. It’s also these people who are prepared to deliver according to this. Ambassadors are often leading others. They are not always managers as people might think. All managers are not Ambassadors, far from all. The Ambassadors are often informal leaders though. You will easy find them volunteering for projects. Loose canons are the people who have engagement but does not quit understand where to direct this. Often they lack the understanding of where they fit in to the big picture. They need increased knowledge and understanding of objectives and strategies. They are often helped by the Ambassadors to grow. The observer is a little bit outside. They probably knows what needs to be done, but don’t really feel that the company listens to them, so why should they listen to the company. The observer has most likely bad experience from a number of change projects that didn’t resulted in real changes. The Observer might very well feel that they are insignificant. They are not important. 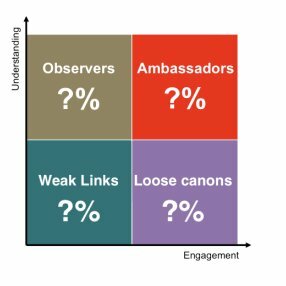 To turn the Observer into Ambassadors you need to give them an honest opportunity to be involved. The Observer can be a great asset. They often have insightful questions and can by first impression be taken for negative. 1998-99 I had a study made in Ericsson where the objective was to identify important communication channels and how effective the communication was. We selected three business areas and four country companies to be a part of the study that was carried out by local communicators together with external communication consultants. One of the most interesting observations we made was that people would like to be more involved, but that they saw few opportunities for that. This was the common observation in all seven measured areas. The conclusion of this is that in order to get people involved it doesn’t take much effort. The week links are the people that have checked out mentally. They don’t have enough understanding or engagement. Don’t spend too much time on this group. It is far more important (and easy) to work with Loose Canons and Observers. Unfortunately many see the Weak Links as the “big problem” and focus all energy on them. Don’t. In the process that starts when working with Observers and Loose Canons some of the Weak Links will follow. They who have the most number of Ambassadors will win! Simply put you could say that internal marketing is all about creating as many Ambassadors as possibly, and that the company or organisation that manage to get the most Ambassadors in their specific market will win the battle of the customers. The Fortune Magazine performs annual studies of the most successful companies in the world (Fortune 500). These studies show that the companies that rank highest are also the one that spend more money internally to create engaged and motivated employees. i.e. Ambassadors.